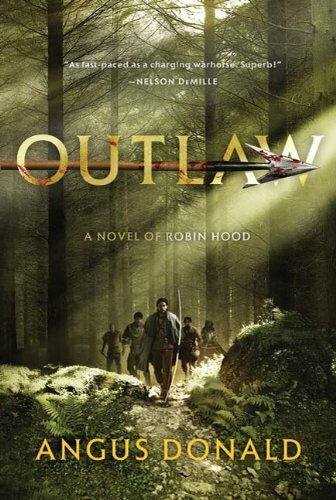 Outlaw: A Novel of Robin Hood, by Angus Donald. St. Martin’s Griffin, 2011; reviewed in the trade paperback edition. The Robin Hood ballads date back to at least the early Renaissance, and probably existed in oral tradition much earlier than that. The stories were revived during the Romantic movement of the early 19th century by Sir Walter Scott and Pierce Egan the Younger (one of Egan’s tales will be included in The Big Book of Swashbuckling Adventure), then perpetuated by Howard Pyle, Henry Gilbert, and other writers into the early 20th century. By the dawn of the silent movie era the image of Robin Hood the daring rogue was well established in the public mind, and he made a seamless transition to cinema, most successfully in the 1922 feature starring Douglas Fairbanks Sr. The climax of this swashbuckler phase was 1938’s The Adventures of Robin Hood, in which Errol Flynn defined the character for the next two generations of books, comics, movies, and television series. By the 1970s the legend was ripe for reimagining, and the ball really got rolling with the 1976 movie Robin and Marian, the first important entry in what I call “Revisionist Robin Hoods.” James Goldman’s story, directed by Richard Lester (The Three Musketeers and The Four Musketeers), placed Robin squarely in the brutal historical reality of the Third Crusade. An aging Robin Hood (played pitch-perfectly by Sean Connery) returns from the Holy Land to find himself caught up in his own legend. He resumes his bittersweet romance with Marian, as well as his deadly rivalry with the Sheriff of Nottingham, and the inevitable result is mayhem, death, and tears. Since then there has been a steady flow of Revisionist Robin Hoods, in both books and movies, with no sign of it stopping anytime soon. We’re no longer able to accept Robin and his Merrie Men as a jolly gang of innocent do-gooders on a happy campout in Sherwood Forest, so “gritty realism” is the order of the day. This, on the whole, is No Bad Thing, and Angus Donald’s novel Outlaw clearly shows that the genre is not yet worked out. The protagonist of Outlaw is a young peasant thief named Alan Dale, caught for robbery and sentenced to lose a hand, who flees into the greenwood to join Robin and his band. Donald’s portrayal of Sir Robert Odo aka Robin Hood as a charismatic but ruthless renegade knight is convincing, and the author’s portrayal of the hard life of a band of medieval outlaws rings true. Robin’s band is leavened with a cadre of ex-soldiers who train the outlaws in the use of pole-arms and the Welsh longbow, and they become a force that can credibly stand against the footmen and mounted knights the Sheriff sends after them. The author has done his homework, and his depiction of the bloody work of combat in the 12th century is in equal parts thrilling and horrific. Alan Dale’s father was an itinerant troubadour, and Alan has inherited his musical talents, so he becomes the outlaw band’s bard. Also on hands are Donald’s versions of Robin’s right-hand-man John, Tuck the Friar, Much Millerson, Robin’s love Marian – Marie-Anne of Locksley in this retelling, a high-born maiden who takes the story out of the woods and into the Royal Court for some political intrigue. The basic conflict is between downtrodden Saxons and oppressive Normans, a trope that became common to the Robin Hood legend starting with Walter Scott’s 1819 novel Ivanhoe. Of course, in Outlaw not all the Normans are bad and not all the Saxons are good, but Donald’s Sir Ralph Murdac, the Sheriff of Nottingham, is as arrogant and epicene as any nasty Norman noble out of Egan, Scott, or Pyle. He’s a villain who needs killin’. Donald also avails himself of another, more recent addition to the legend: his Robin Hood is so bitterly opposed to the aristocratic establishment that he renounced Christianity and revives the Druidic worship of Cernunnos, and deep in the woods he leads his followers in ancient pagan rituals. Friar Tuck, as you might imagine, has some issues with this. The book is fast-paced, the characters are memorable and well-drawn, and the dialogue is crisp and modern. The novel’s climax is an exciting set-piece battle between Robin’s eclectic forces and the Sheriff’s knights and mercenary men-at-arms, with sudden but believable reversals of fortune leading up to a satisfying ending. It has a sequel, Holy Warrior, in which Robin and his men follow King Richard to the Crusades. Watch this space for a review in a future posting. “Outlaw” is available from Amazon in trade paperback, Kindle download, and unabridged Audible download formats. Katabasis: A Novel of the Foreworld,by Joseph Brassey, Cooper Moo, Mark Teppo, and Angus Trim. 47North, 2013; reviewed in the trade paperback edition. “Katabasis” is a sequel to “The Mongoliad” trilogy, a series of historical adventures set in the 13th century in Europe and Asia. Like the books that preceded it, this novel was written by a group of collaborators, though unlike “The Mongoliad” this book lacks the marquee names of Neal Stephenson and Greg Bear. It’s part of the ongoing “Foreworld Saga,” and you have to give them credit for the clever name, as Foreworldsays “history,” but with a tone familiar to Fantasy and Sci-Fi readers, the better to market it to them. And this makes sense, as 47North is Amazon’s F&SF imprint. The common thread binding together the authors of the “Mongoliad” trilogy was an interest in a realistic portrayal of medieval martial arts. We’ve all heard the discussion: “Assuming equal skill, what would happen if an armored knight fought a samurai?” Well, these folks decided to answer that question, in spades, adding in Viking warriors, Welsh longbowmen, Mongolian horse archers, and a Korean with a polearm for the sake of completeness. There was a sizeable cast of characters, from Rome to the Russian steppes, to Mongolia and western China, all involved in a great deal of very credible medieval mayhem. The protagonists were thin but likeable, the settings were interesting and believable, and the story moved right along, but when it ended, it left a number of questions open and hanging. “Katabasis” picks up right where “The Mongoliad” left off, continuing the story of the band of western knights who went to the far east to attempt to assassinate the Khan of the Mongols, now returning, pursued, to the west. And it introduces new characters in the Rus of Kiev and Novgorod, a land just recovering from being ravaged by the Mongol Horde, and now facing a new threat from west in the form of the Teutonic Knights. The story culminates in the celebrated clash between the German knights and the Russians led by Alexander Nevsky. Like its predecessors, “Katabasis” strings together a number of set-piece battles between disparate opponents, this time highlighting the efforts of Yasper, the Dutch alchemist. Those of you who are players of fantasy role-playing games who have ever wondered, “What actual good would a combat alchemist be to a party of warriors?” will find an answer here. Though the authors are all newcomers the novel is well-written enough – I noticed a few rough spots in the early chapters, but then the writers seem to have hit their stride and the rest was pretty polished. In a novel written by four authors one expects to see slight stylistic differences from chapter to chapter, but the handoffs here are relatively smooth and any noticeable seams are easily forgiven. “Who is chasing you?” Bruno asked, breaking the silence. “All of them, probably,” Vera replied casually as if she were commenting on the mild weather they were having. It gets the job done, with just a touch of swashbuckling swagger. “The Mongoliad” was 95% historical adventure, but it had elements of mysticism woven into its story, so technically it qualifies as fantasy, albeit of the mild “What if there was some truth behind old superstitions?” category. “Katabasis” leans more heavily on these mystical elements. It’s most successful at this when it stays rather vague, merely linking together mythic undercurrents common to several cultures. Once they bring the Russian witch Baba Yaga onstage the story veers into the fantastic, and the authors have trouble keeping it credible. But it all works out in the end, and there’s a satisfactory bang-up conclusion that ties things together pretty well, at least for this set of characters. (Another “Foreworld” novel is promised that will address the fates of those “Mongoliad” protagonists who stayed in the west.) Recommended, especially if you enjoyed the previous “Foreworld” books. “Katabasis” is available from Amazon in trade paperback, Kindle download, unabridged audio CD, and unabridged Audible download formats. Additional digital-only stories are available at www. foreworld.com.